This list identifies what my husband used, packed, and purchased while on 5 weeks’ sailing training with Ondeck Sailing. The list is accurate as it was revised-post trip. He had no checked bags, and had carry-on luggage only. The quantity of items is one, except where indicated in brackets. * A toque in the Caribbean you say? We never go anywhere without a toque because we’re Canadians. Take it from us – a bare head has lots of exposed surface area. A toque is a lightweight solution to staying warm anywhere. 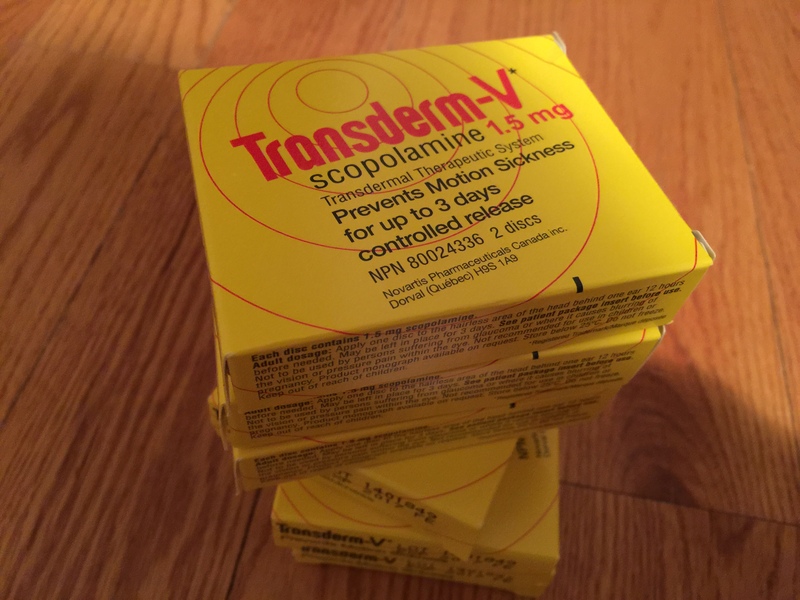 ** Here is a picture of my husband’s 6-box supply of Scopolamine patches. They are applied behind the ear and help to prevent motion sickness. I figured he’d be on a boat for about 4 weeks before he heads to the Miami International Boat Show. Did I buy too many boxes? Answer: No. He brought ended up bringing 3 boxes of Scopolamine patches. Each box contains 2 patches. My husband used 2 patches himself, and gave 3 patches away to other sailors. I’ll bring the rest of the patches with me when I go to Antigua for sailing training in April though I hope not to use them.